The extremely strange town of Night Vale will be familiar to listeners to the popular podcast which has been going since 2012. 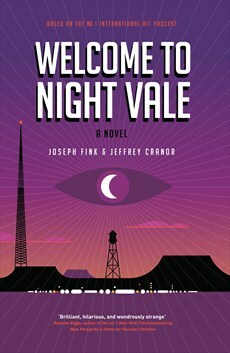 For those who have never heard about the town of Night Vale – which is ruled over by a glow cloud (all hail the mighty glow cloud), where the most dangerous place is the library, it is subversive to believe in mountains, the most popular dish at the diner is invisible pie and where the police have been replaced by secret police who are always listening – this novelisation of the podcast is an eye opening and brain-tingling experience. Jackie Fierro and Dianne Crayton are both searching for something. Jackie, a perpetual nineteen year old, is looking for a man she can’t remember who gave her a slip of paper that she can not get rid of with the words KING CITY written on it. Diane is searching for a missing work colleague who no one remembers and is side-tracked when she spots the father of her shape-shifting teenage son Josh, who left town when Josh was a baby. The narrative alternates between their separate and then shared quests. There is a plot to Welcome to Night Vale, but it is almost overwhelmed by the surrealist wordplay and strange goings on. The characters themselves are also more defined by the weirdness in their lives and do not really emerge as fully formed. The podcast of Welcome to Night Vale is the broadcast of the Night Vale Community Radio station run by Cecil Baldwin who brings “all the news and community goings-on that you need to know and hide from you all the forbidden and dangerous knowledge”. Cecil’s monologues drop in to the plot to provide valuable information to both the reader and the characters themselves and bring out more of the sinister and crazy world of Night Vale. Cecil’s boyfriend Carlos, a scientist who lives in the science district of town, a variety of interns and other characters from the podcast also feature. For all of its strangeness and other-worldliness there is a deep strain of humanism in Welcome to Night Vale. Many of the stories are laced with melancholy and regret, focussing on people finding or losing their place in the world. The plot itself centres on Diane’s relationship with a teenager who she barely understands and Jackie’s relationship with her mother which, similarly, is slipping away from her. Like the best satire, there are serious themes here, lightly and sensitively dealt with through the lens of the weird and macabre. Welcome to Night Vale, much like the podcast, will appeal to readers with a particular sensibility – those who enjoy wordplay, surrealist humour and a sideways glimpse of the world. It is a joyous potpourri of influences – Part Addams Family and part Douglas Adams, or the Twilight Zone meets Mel Brooks, or perhaps a mash up of Terry Gilliam and Edward Gorey. On all counts a revelation.